Arianwen Rollan, a 17-year-old student from Cebu City National Science High School, found that Malunggay seed extract may help hamper the growth of tumors. Her experiments on chick embryos showed that the extract affects the growth of blood vessels, essentially starving tumor cells of nutrients. “When there is a tumor, there will be a rapid development of blood vessels. The more blood vessels, there will be more nutrients supplied to the tumor. In this case, we need to inhibit the development of these blood vessels in order to cut off its source of nutrients,” she explained. Rollan's research bagged her the Qatar Foundation's First Award for Research and Development in Medical Science at year’s Intel International Science and Engineering Fair (ISEF), the world’s largest high school science research competition. “I really hope that our government would establish a special organization with complete facilities that gives more attention to these kinds of projects,” she said. “There are a lot of bright young minds in our country and the only problem is that there is no one to help them fund their research. 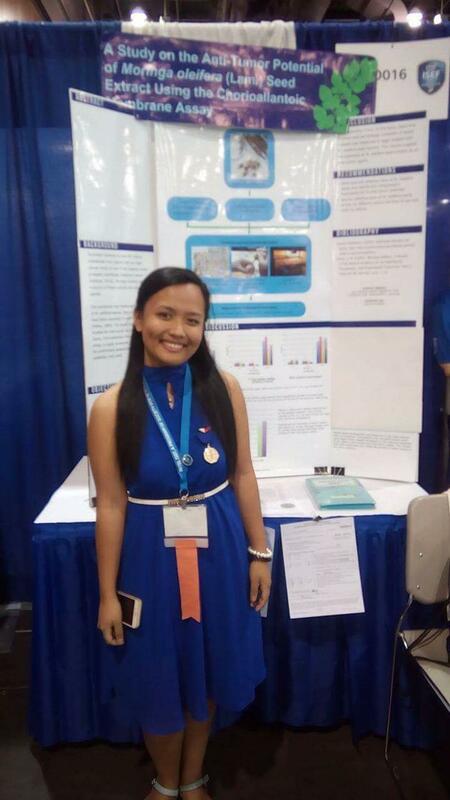 “I never thought that I would reach ISEF because before, I was just watching and reading about it from the internet. I thought that I never would have a chance to go that far,” she said. The death of her grandmother due to cancer is one of the main reason that made her to pursue this line of research. Rollan hopes that her preliminary study give a way for more research and, development of an affordable and accessible anti-tumor treatment. “I didn't expect my name to be called since there were only a few awards left to be given. When I reached backstage, I was really shaking because of shock and happiness,” she added. Rollan hopes her example encourages other young people to leave their own marks in science and research. “I realized that cancer drugs are very expensive and these also have fatal side effects. This inspired me to look for a natural agent against cancer,” she said.